If you think that piece of plastic above is just a toy, you'd be wrong. It's an actual gun. That fires standard handgun bullets. That's 3D printed. Yes, printed. It's the first entirely 3D printed gun, previous 3D printed weapons have just been specific parts. Welcome to the future. 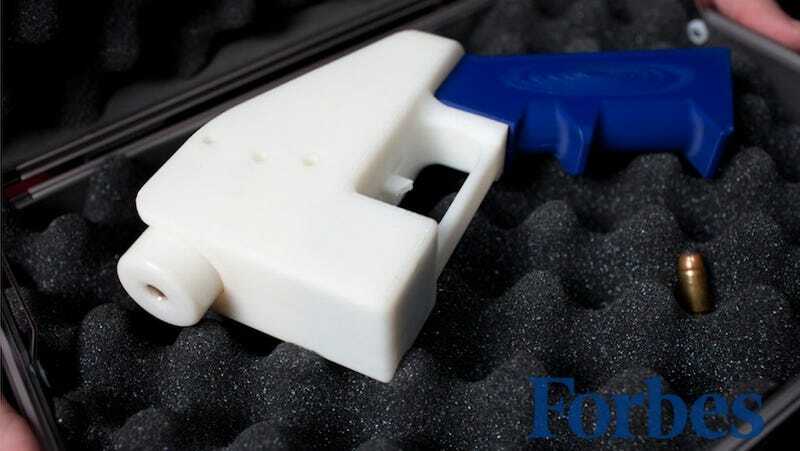 The 3D printed gun, called 'The Liberator', was made by Cody Wilson, the 25-year-old University of Texas law student who was the star of Motherboard's documentary Click. Print. Gun. Wilson has built the prototype weapon above and plans to release the CAD files for the gun next week to the public. Basically, anyone will then be able to print the weapon with no background checks or serial numbers. Watch the Full Documentary About 3D Printed Weapons: Click. Print. Gun.